Many mystery novels follow the formula of starting with a body found, but the best ones I have read recently stray from that template, and Blood and Bond is one of them. What an intriguing and timely story Kae Cheatham tells, with an environmental crime at its center: the violation by three white men of the hunting prohibition in Spirit Canyon, an idyllic Wyoming valley once sacred to the Shoshoni Indian. The three men suffer a Job's share of tragedy in subsequent years. One of them, Pete Waldham, wants his question answered: Were they cursed by their actions that day? He enlists a reluctant Eddie CloudRunner, an American Indian raised by a white Wyoming family and, for the most part, fully assimilated into mainstream life off the reservation, to get to the bottom of the mystery. As additional tragedies ensue, Eddie, a schoolteacher and surely one of the most likeable protagonists in recent fiction, must confront his Indian heritage and the ancestral spiritual identity that he has long denied. The author vividly creates sympathetic characters on both sides of the book's central question and wonderful, you-are-there descriptions of the landscape, the weather (blizzard!) and the way of life in a contemporary Wyoming ranching community. The subplots are strong--particularly the recurring episodes of blindness for Pete's daughter, whose romance with Runner's white bond-brother Jess fuels the book's momentum. Beth's story is really more than a subplot; she and Runner are a pair of anchors for the book, and their shared blindness (Runner's of the metaphorical variety in having turned away from the beliefs of his blood family) is an ingenious choice for telling the story. I belonged to a writers' group in Nashville, Tennessee, years ago when this novel was germinating. Kae occasionally read sections of it, in bits and pieces. If I recall correctly, the working title at that time was Spirit Canyon. Time brings focus, and the final title, Blood and Bond, perfectly sums up the core conflict. Bravo, and what a pleasure to see the final, powerful and entertaining puzzle complete. 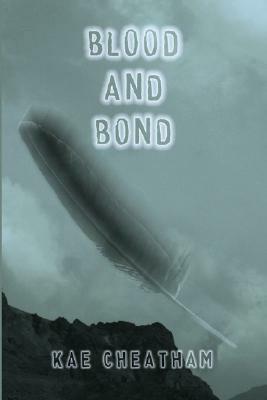 Sign into Goodreads to see if any of your friends have read Blood and Bond. What a terrific review! I'll put it on my to-read list right now.